Matthias Corvinus as depicted in Chronica Hungarorum by Johannes de Thurocz. Matthias Corvinus (Matthias the Just) (February 23, 1443 – April 6, 1490) was king of Hungary and Croatia, ruling between 1458 and 1490. Corvinus is derived from the Latin for "raven," thus he is also referred to as "the Raven King" (A raven is emblazoned on his coat of arms). He was also crowned King of Bohemia in 1469, and ruled Moravia, Silesia, and Lusatia; from 1486, Matthias was Duke of Austria. He is credited with re-shaping Hungary, which for some time had been threatened internally by lack of strong central leadership and externally by threat of invasion. He consolidated the monarchy through various reforms, including increasing the role of the lesser nobility, making the tax system fairer and initiating the codification of the law. He not only confirmed Hungary's borders but extended his rule into neighboring states to the south and west. Like his father, John Hunyadi he is an iconic figure in the European resistance to Ottoman expansion. Despite high taxation and a somewhat lavish life-style, he is remembered for his patronage of learning and for his concern for justice. In the context of his time, he appears to have governed as an enlightened ruler who tried to replace anarchy caused by each baron exercising autonomy with a more centralized and participatory system, offsetting the power of the barons by enhancing that of the lesser nobility. Matthias (Hungary: Hunyadi Mátyás) was born at Kolozsvár (present-day Cluj-Napoca) in the house currently known as Matthias Corvinus House, the second son of John Hunyadi—a successful military leader of Kuman and Hungarian descent, who had risen through the ranks of the nobility to become regent of Hungary—and Erzsébet Szilágyi, from a Hungarian noble family. The later epithet Corvinus was coined by Matthias' biographer, the Italian Antonio Bonfini, who claimed that the Hunyadi family (whose coat of arms depicts a raven—corvus in Latin) descended from the ancient Roman gens of the Corvini. Corvinus heraldry as depicted in Johannes de Thurocz's German manuscript (1490). His tutors were the learned Janos Vitez, bishop of Nagyvarad, whom he subsequently raised to the primacy, and the Polish humanist Gregory of Sanok. The precocious Matthias quickly mastered German, Italian, Romanian, Latin, and principal Slavic languages, frequently acting as his father's interpreter at the reception of ambassadors. His military training proceeded under the eye of his father, whom he began to follow on his campaigns when only twelve years of age. In 1453, he was created count of Bistercze, and was knighted at the siege of Belgrade in 1454. The same care for his welfare led his father to choose him a bride in the powerful Cilli family, but the young Elizabeth died before the marriage was consummated, leaving Matthias a widower at the age of fifteen. 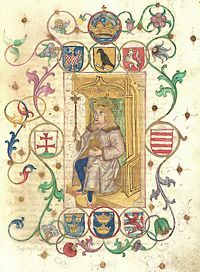 After the death of Matthias's father, there was a two-year struggle between Hungary's various barons and its Habsburg king, Ladislaus Posthumus (also king of Bohemia), with treachery from all sides. Matthias's older brother László Hunyadi was one party attempting to gain control. Matthias was inveigled to Buda by the enemies of his house, and, on the pretext of being concerned in a purely imaginary conspiracy against Ladislaus, was condemned to decapitation, but was spared on account of his youth. In 1457, László was captured with a trick and beheaded, while the king died (possibly of poisoning) in November of that year. Matthias was taken hostage by George of Podebrady, governor of Bohemia, a friend of the Hunyadis who aimed to raise a national king to the Magyar throne. Podebrady treated Matthias hospitably and affianced him with his daughter Catherine, but still detained him, for safety's sake, in Prague, even after a Magyar deputation had hastened thither to offer the youth the crown. Matthias took advantage of the memory left by his father's deed, and by the general population's dislike of foreign candidates; most the barons, furthermore, considered that the young scholar would be a weak monarch in their hands. An influential section of the magnates, headed by the palatine László Garai and by the voivode of Transylvania, Miklós Ujlaki, who had been concerned in the judicial murder of Matthias's brother László, and hated the Hunyadis as semi-foreign upstarts, were fiercely opposed to Matthias's election; however, they were not strong enough to resist against Matthias's uncle Mihaly Szilagyi and his 15,000 veterans. 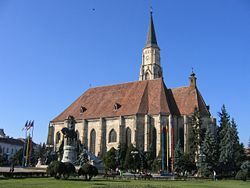 Cluj-Napoca (Kolozsvár) and the Mátyás Statue (in Transylvania). The Hungarian town of Buda (today one half of Budapest) in the Nuremberg Chronicle. Thus, on January 20, 1458, Matthias was elected king by the Diet. At this time Matthias was still a hostage of George of Podebrady, who released him under the condition of marrying his daughter Kunhuta (later know as Catherine). On January 24, 1458, 40,000 Hungarian noblemen, assembled on the ice of the frozen Danube, unanimously elected Matthias Hunyadi king of Hungary, and on February 14, the new king made his state entry into Buda. Matthias was 15 when he was elected King of Hungary: At this time the realm was surrounded by threats. The Turks and the Venetians threatened it from the south, the emperor Frederick III from the west, and Casimir IV of Poland from the north, both Frederick and Casimir claiming the throne. The Czech mercenaries under Giszkra held the northern counties and from thence plundered those in the centre. Meanwhile Matthias's friends had only pacified the hostile dignitaries by engaging to marry the daughter of the palatine Garai to their nominee. Matthias, however, not unnaturally, refused to marry into the family of one of his brother's murderers, and on February 9, confirmed his previous nuptial contract with the daughter of Podébrady, who shortly afterwards was elected king of Bohemia (March 2, 1458). Throughout 1458, the struggle between the young king and the magnates, reinforced by Matthias's own uncle and guardian Szilagyi, was acute. But Matthias, who began by deposing Garai and dismissing Szilagyi, and then proceeded to levy a tax, without the consent of the Diet, in order to hire mercenaries, easily prevailed. 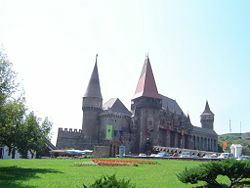 He recovered the Golubac Fortress from the Turks, successfully invading Serbia, and reasserting the suzerainty of the Hungarian crown over Bosnia. In the following year there was a fresh rebellion, when the emperor Frederick was actually crowned king by the malcontents at Vienna-Neustadt (March 4, 1459); Matthias, however, drove him out, and Pope Pius II intervened so as to leave Matthias free to engage in a projected crusade against the Turks, which subsequent political complications, however, rendered impossible. On May 1, 1461, the marriage between Matthias and Podiebrad's daughter took place. From 1461 to 1465, the career of Matthias was a perpetual struggle punctuated by truces. Having come to an understanding with his father-in-law Podébrady, he was able to turn his arms against the emperor Frederick. In April 1462, the latter restored the holy crown for 60,000 ducats and was allowed to retain certain Hungarian counties with the title of king; in return for which concessions, extorted from Matthias by the necessity of coping with a simultaneous rebellion of the Magyar noble in league with Podébrady's son Victorinus, the emperor recognized Matthias as the actual sovereign of Hungary. Only now was Matthias able to turn against the Turks, who were again threatening the southern provinces. He began by defeating the Turk general Ali Pasha, and then penetrated into Bosnia, capturing the newly built fortress of Jajce after a long and obstinate defense (December 1463). On returning home he was crowned with the holy crown on March 29, 1464. Twenty-one days after, on March 8, the 15 year old Queen Catherine died in childbirth. The child, a son, was stillborn. After driving the Czechs out of his northern counties, he turned southwards again, this time recovering all the parts of Bosnia which still remained in Turkish hands. 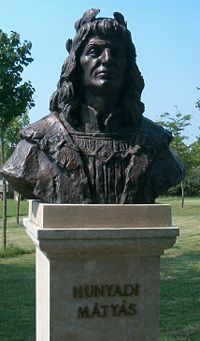 Bronze bust of Matthias in Nemzeti Történeti Emlékpark, Ópusztaszer. Matthias gained independence of and power over the barons by dividing them, and by raising a large royal army, fekete sereg (the King's Black Army of Hungary of mercenaries), whose main force included the remnants of the Hussites from Bohemia. At this time, Hungary reached its greatest territorial extent of the epoch (present-day southeastern Germany to the west, Dalmatia to the south, Eastern Carpathians to the east, and Poland to the north). Soon after his coronation, Matthias turned his attention upon Bohemia, where the Hussite leader George of Podebrady had gained the throne. In 1465, Pope Paul II excommunicated the Hussite King and ordered all the neighboring princes to depose him. On May 31, 1468, Matthias invaded Bohemia but, as early as February 27, 1469, Matthias anticipated an alliance between George and Frederick by himself concluding an armistice with the former. On May 3, the Bohemian Catholics elected Matthias king of Bohemia, but this was contrary to the wishes of both pope and emperor, who preferred to partition Bohemia. George however anticipated all his enemies by suddenly excluding his own son from the throne in favor of Ladislaus, the eldest son of Casimir IV, thus skillfully enlisting Poland on his side. The sudden death of Podebrady in March 1471, led to fresh complications. At the very moment when Matthias was about to profit by the disappearance of his most capable rival, another dangerous rebellion, headed by the primate and the chief dignitaries of the state, with the object of placing Casimir, son of Casimir IV, on the throne, paralyzed Matthias's foreign policy during the critical years 1470-1471. He suppressed this domestic rebellion indeed, but in the meantime the Poles had invaded the Bohemian domains with 60,000 men, and when in 1474, Matthias was at last able to take the field against them in order to raise the siege of Breslau, he was obliged to fortify himself in an entrenched camp, whence he so skillfully harried the enemy that the Poles, impatient to return to their own country, made peace at Breslau (February 1475) on an uti possideti basis, a peace subsequently confirmed by the congress of Olmiitz (July 1479). During the interval between these pieces, Matthias, in self-defense, again made war on the emperor, reducing Frederick to such extremities that he was glad to accept peace on any terms. By the final arrangement made between the contending princes, Matthias recognized Ladislaus as king of Bohemia proper in return for the surrender of Moravia, Silesia, and Upper and Lower Lusatia, hitherto component parts of the Bohemian monarchy, till he should have redeemed them for 400,000 florins. 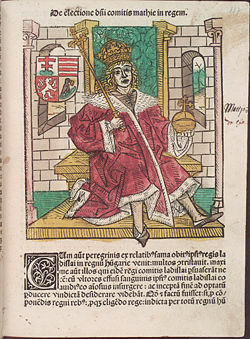 The emperor promised to pay Matthias a huge war indemnity, and recognized him as the legitimate king of Hungary on the understanding that he should succeed him if he died without male issue, a contingency at this time somewhat improbable, as Matthias, only three years previously (December 15, 1476), had married his third wife, Beatrice, daughter of Ferdinand I of Naples. The emperor's failure to follow through on these promises induced Matthias to declare war against him for the third time in 1481. The Hungarian king conquering all the fortresses in Frederick's hereditary domains. Finally, on June 1, 1485, at the head of 8,000 veterans, he made his triumphal entry into Vienna, which he henceforth made his capital. Styria, Carinthia, and Carniola were next subdued; Trieste was only saved by the intervention of the Venetians. Matthias consolidated his position by alliances with the dukes of Saxony and Bavaria, with the Swiss Confederation and the archbishop of Salzburg, establishing henceforth the greatest potentate in central Europe. Matthias introduced a series of reforms designed to improve internal stability. He abolished tax privileges for large landowners, strengthened the power of the lesser aristocracy to curb that of the barons and commissioned a codification of the legal system. Internally, he relied on diplomacy and negotiation to achieve his goals. He further developed the standing army, an innovation introduced by his father which may in part have imitated the Janissaries against whom they fought. In 1471, Matthias renewed the Serbian Despotate in south Hungary under Vuk Grgurević for the protection of the borders against the Turks. In 1479, a huge Turkish army, on its return home from ravaging Transylvania, was annihilated at Szászváros (modern Orăştie, October 13, 1479). The following year Matthias recaptured Jajce, drove the Turks from northern Serbia and instituted two new military banats, Jajce and Srebernik, out from reconquered Bosnian territory. In 1480, when a Turkish fleet seized Otranto in the Kingdom of Naples, at the earnest solicitation of the pope he sent the Hungarian general, Balasz Magyar, to recover the fortress, which surrendered to him on May 10, 1481. Again in 1488, Matthias took Ancona under his protection for a while, occupying it with a Hungarian garrison. On the death of sultan Mehmet II in 1481, a unique opportunity for the intervention of Europe in Turkish affairs presented itself. A civil war ensued in Turkey between his sons Bayezid and Cem; the latter, being worsted, fled to the knights of Rhodes, by whom he was kept in custody in France. Matthias, as the next-door neighbor of the Turks, claimed the custody of so valuable a hostage, and would have used him as a means of extorting concessions from Bayezid. But neither the pope nor the Venetians would accept such a transfer, and the negotiations on this subject greatly embittered Matthias against the Papal court. The last days of Matthias were occupied in endeavoring to secure the succession to the throne for his illegitimate son János; Queen Beatrice, though childless, fiercely and openly opposed the idea and the matter was still pending when Matthias, who had long been crippled by gout, expired very suddenly on Palm Sunday, April 4, 1490. At times Matthias had Vlad III Ţepeş, the Prince of Wallachia, as his vassal. Although Vlad had great success against the Ottoman armies, the two Christian rulers disagreed in 1462, leading to Matthias imprisoning Vlad in Buda (Matthias, according to some sources, betrayed him). However, wide-ranging support from many Western leaders for Vlad III prompted Matthias to gradually grant privileged status to his controversial prisoner. As the Ottoman Empire appeared to be increasingly threatening as Vlad Tepes had warned, he was sent to reconquer Wallachia with Hungarian support in 1476. Despite the earlier disagreements between the two leaders, it was ultimately a major blow to Hungary's status in Wallachia when Vlad was assassinated that same year. In 1467, a conflict erupted between Matthias and the Moldavian Prince Stephen III, after the latter became weary of Hungarian policies in Wallachia and their presence at Kilia; added to this was the fact that Matthias had already taken sides in the Moldavian conflicts preceding Stephen's rule, as he had backed Alexăndrel (and, possibly, the ruler referred to as Ciubăr Vodă), deposing Petru Aron. Stephen occupied Kilia, sparking Hungarian retaliation, that ended in Matthias' bitter defeat in the Battle of Baia in December (the King himself is said to have been wounded thrice). In the course of his expansion, Matthias strengthened his state's diplomacy. Apart from his regular network of relations with his neighbors, as well as the Pope and Kingdom of Naples, he established regular contacts with France, Burgundy, Switzerland, Florence, most German states, Russia and, occasionally, with Persia and Egypt. Matthias's empire collapsed after his death, since he had no children except for an illegitimate son, János Corvinus, whom the noblemen of the country did not accept as their king. The weak king of Bohemia, Ladislaus II of the Polish/Lithuanian Jagiellon line, followed him—Ladislaus nominally ruled the areas Matthias conquered except Austria—but real power was in the hand of the nobles. In 1514, two years before Ladislaus's death, the nobility crushed the peasant rebellion of György Dózsa with ruthless methods. As central rule degenerated, the stage was set for a defeat at the hands of the Ottoman Empire. In 1521, Belgrade fell, and, in 1526, the Hungarian army was destroyed by the Turks in the Battle at Mohács. High taxes, mostly falling on peasants, to sustain Matthias' lavish lifestyle and the Black Army (cumulated with the fact that the latter went on marauding across the Kingdom after being disbanded upon Matthias's death) could imply that he was not very popular with his contemporaries. But the fact that he was elected king in a small anti-Habsburg popular revolution, that he kept the barons in check, persistent rumors about him sounding public opinion by mingling among commoners incognito, and the harsh period witnessed by Hungary later, ensured that Matthias' reign is considered one of the most glorious chapters of Hungarian history. Songs and tales converted him into Matthias the Just (Mátyás, az igazságos in Hungarian), a ruler of justice and great wisdom, as arguably the most popular hero of Hungarian folklore. He is also one of the sleeping kings. This popularity is partially mirrored in modern Romania: Nineteenth century Romantic nationalism invested in Matthias and his fathers' Vlach origins, their Christian warrior stances, and their cultural achievements. Despite the high taxation, a local saying said that with his death, justice also died. Reputedly, people even said that if he could only return from the dead, they would gladly pay even higher tax. It has been suggested that this sentiment may have stemmed from the general deterioration experiences by Hungary after his death. His empire did not survive. Central governance weakened. In 1526, the Ottomans won the Battle of Mohács and Hungary ceased to exist as a single polity, until 1699, when, after the Great Turkish War the Ottomans ceded their Hungarian territory to the Habsburgs, who became Kings of Hungary. 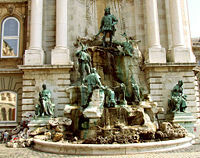 Matthias as a figure of Romance: The Mátyás Fountain, Budapest (Alajos Stróbl, 1902). Matthias was educated in Italian, and his fascination with the achievements of the Italian Renaissance led to the promotion of Mediterranean cultural influences in Hungary. He was known as a fried of the Muses. Buda, Esztergom, Székesfehérvár, and Visegrád were amongst the towns in Hungary that benefited from the establishment of public health and education and a new legal system under Matthias' rule. In 1465, he founded a university in Pressburg (present-day Bratislava, Slovakia), the Universitas Istropolitana. His 1476 marriage to Beatrice, the daughter of the King of Naples, only intensified the influence of the Renaissance. He developed close diplomatic relations with such cultural centers as Florence and Milan. An indefatigable reader and lover of culture, he proved an extremely generous patron, as artists from the Italian city-states (such as Galeotto Marzio) and Western Europe were present in large numbers at his court. His library, the Bibliotheca Corviniana, was Europe's greatest collection of historical chronicles and philosophic and scientific works in the fifteenth century, and second only in size to the Vatican Library. Like many of his acculturated contemporaries, he trusted in astrology and other semi-scientific beliefs; however, he also supported true scientists and engaged frequently in discussions with philosophers and scholars. In 1490, when the Turks invaded, his Library was dispersed across Europe. Several efforts have been made to catalog this collection. He spoke Hungarian, Romanian, Croatian, Latin, and later also German and Czech. ↑ Enver Hasani, Uti Possidetis Juris: From Rome to Kosovo, Forum of World Affairs. Retrieved July 19, 2008. Corvinus, Matthias. 1994. Matthias Corvinus and the Humanism in Central Europe. Budapest: Balassi Kiadó. ISBN 9789637873720. Feuer-Tóth, Rózsa. 1990. Art and Humanism in Hungary in the Age of Matthais Corvinus. Budapest: Akadémiai Kiadó. ISBN 9789630556460. Sugar, Peter F., Péter Hanák, and Tibor Frank. 1990. A History of Hungary. Bloomington, IN: Indiana University Press. ISBN 9780253355782. Tanner, Marcus. 2008. The Raven King: Matthias Corvinus and the Fate of His Lost Library. New Haven, CT: Yale University Press. ISBN 9780300120349. All links retrieved September 4, 2018. The Squash and the Colt, a folk tale reflecting Matthias' wisdom and sense of justice. Bibliotheca Corviniana Digitalis - National Széchényi Library, Hungary. 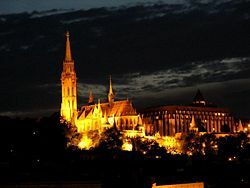 History of "Matthias Corvinus of Hungary"
This page was last modified on 4 September 2018, at 15:31.